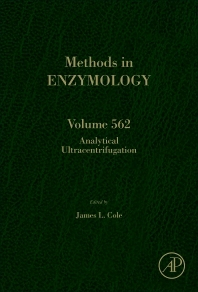 Analytical Ultracentrifugation, the latest volume in Methods in Enzymology, focuses on analytical ultracentrifugation. The scope of this technique has greatly expanded in recent years due to advances in instrumentation, algorithms and software. This volume describes the latest innovations in the field and in the applications of analytical ultracentrifugation in the analysis of macromolecules, macromolecular assemblies, and biopharmaceuticals. The intended audience includes: biophysicists interested in macromolecular interactions, thermodynamics and hydrodynamics, biochemists and molecular biologists who wish to use analytical ultracentrifugation, and researchers in the biotechnology industry who are interested in the applications of analytical ultracentrifugation in characterization of biopharmaceuticals. Dr. Cole received a Sc.B. in Biochemistry from Brown University. He obtained his Ph.D. in Biophysical Chemistry at UC Berkeley where he investigated the mechanism of photosynthetic oxygen evolution. He carried out postdoctoral research at Stanford University on the structure and function of metalloenzymes that interact with oxygen. In 1991, he took a position at Merck Research Laboratories in antiviral drug discovery. Dr. Cole applied analytical ultracentrifugation and related biophysical techniques to probe macromolecular interactions that regulate replication of HIV, Influenza and Hepatitis C virus. In 2001, he to return to academia and moved to the Department of Molecular and Cell Biology at the University of Connecticut, where he is professor of structural biology, biophysics and biochemistry. His research group uses biophysical approaches to characterize macromolecular interactions that regulate important biological processes. A major focus is the innate immunity pathway for defense against viral infection. In an NIH-supported research program, his group has defined the mechanism for activation of protein kinase R by RNA. He directs the National Analytical Ultracentrifugation Facility and holds a joint appointment in the department of Chemistry at the University of Connecticut. He is a member of the editorial board of Biophysical Journal. He is the author of 84 publications and reviews.